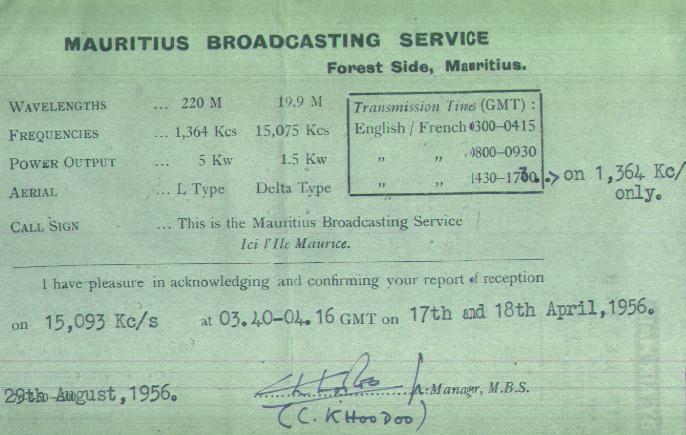 QSL letter from the Mauritius Broadcasting Service, Forest Side, for a report of 17 April 1955 on 15.093 MHz. Power was 1500 watts. This was a very, very rare catch from the U.S. west coast. Mauritius was still a British colony at this time. This neat QSL is from the collection of Mike Christie, K7RLS, in Crawfordville, FL.